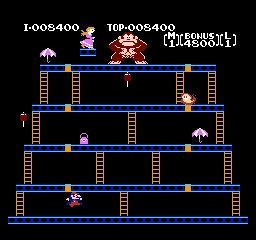 As many will know, the mighty Miyamoto made his mark at Nintendo and indeed the world with this very game in the arcades. Donkey Kong was quite unique for its day; in arcades full of Space Invaders and Pac-Man clones, a platform game like was something new. Playing as Jumpman — who would later become known as Mario — you are tasked with rescuing your beloved Pauline from the clutches of the nasty Donkey Kong. The only trouble is the fiendish ape has perched himself at the top of a structure of fractured girders and broken ladders. To reach him you need to jump over barrels and climb the ladders to reach the top. Your only protection is to pick up a giant mallet from time to time to whack everything that stands in your way. Sadly the NES conversion of the arcade is not completely faithful to the arcade original. 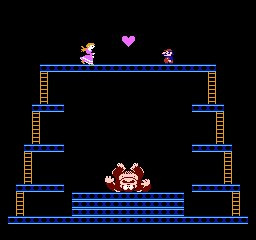 It only features three of the original four stages, loses the opening cutscene in which Donkey Kong stomps the girders into place and a few other things. It really is a cut down experience of the original arcade classic. Despite this, it was the perfect killer app for the NES launch and we doubt that gamers would have minded back then. Heck, just having a vague facsimile of the much loved arcade game was an amazing thing. 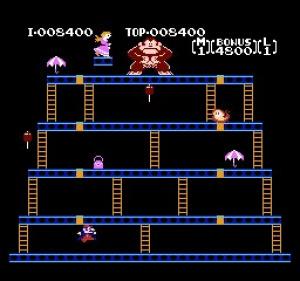 In short blasts there is no question that Donkey Kong is still very addictive to this day. You can keep coming back to it time and time again to chip away at your previous high score. If you happen to be a nostalgic gamer with rose tinted spectacles firmly in place, or even a huge Nintendo fan who wants to get to grips with the company’s back catalogue, this could be for you. Sadly we feel for the average gamer this game really isn’t worth the investment. For most the appeal will be short term at best; your precious Wii points could be spent better elsewhere. brighter colour, one level more, etc. 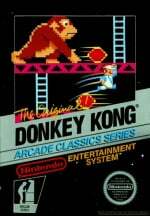 This game is a classic, and while it may not be the entire game, it still plays just like I remember it for the Colecovision. 4/10? I don't get it. I'd give it at least a 6/10, and a 7/10 seems much more fair and reasonable. 4 is so mean considering how old it is. Its like calling an famous old man not cool even though hes old. I rather go for the arcade version since that has right colors. Along with Mario Bros.. This game was fun. 4/10 is wayyyyyyy to harsh. I really don't understand why both this and junior got a 4, unless it's because of the steep price. I would have to disagree with that review. more of an 8/10 but a 4? that is so low! its now gonna be an 8/10 because its a much better investment! Definitely worth 500 points! This is an awesome and very addictive game! You will more than make up for the $5 in one sitting! Only thing that would make this review make sense as a 4/10 is if the arcade version was available, but alas it isn't, so this is the next best thing 7/10 for me! this game 7/10.............4???? come on.. Seriously? People ask for this be rated an 8/10? For what reason? It used to be a neat game, but it hasn't aged gracefully. 4/10 is exactly the right score in my opinion.